Governor Dayton recently proposed a one-time “emergency aid” increase of $138 million to Minnesota public schools in fiscal year (FY) 2019, in the form of a two percent increase in basic general education formula revenue and selected categorical aid programs. This aid increase would replace a portion of the real (i.e., inflation-adjusted) per pupil school funding loss that the vast majority of districts have experienced since FY 2003—the year in which the state assumed funding of nearly all K-12 general education expenses. 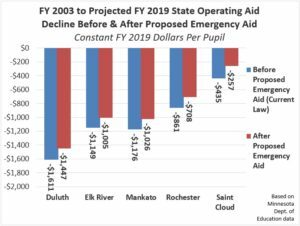 A table comparing the projected change in real per pupil state operating aid for all 332 Minnesota school districts from FY 2003 to FY 2019 before and after the Governor’s proposed FY 2019 emergency school aid is available here. The charts below illustrate this information for a cross section of large and small, metro and rural school districts. All amounts shown are based on Minnesota Department of Education data and displayed in constant FY 2019 dollars per pupil. The four largest school districts in the seven-county metropolitan area by student enrollment are the Anoka-Hennepin, Saint Paul, Minneapolis, and Rosemount-Apple Valley-Eagan districts. 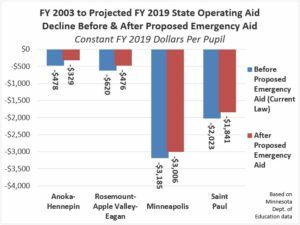 In constant FY 2019 dollars, FY 2019 state operating aid to the Anoka-Hennepin district is projected to be $478 per pupil less than it was in FY 2003; the proposed $149 per pupil emergency aid would reduce the net aid decline to $329 per pupil. The projected net real per pupil aid loss from FY 2003 to FY 2019 in the Anoka-Hennepin and Rosemount districts is somewhat less than the statewide average decline. The net aid loss in the two central city districts of Saint Paul and Minneapolis is considerably greater—in fact, it is among the largest in the state. 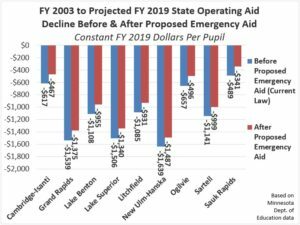 One thing that all four districts have a common with the vast majority of other districts is that they lost considerable state aid since FY 2003; the Governor’s proposed emergency aid would restore a significant portion of this loss—at least on a one-time basis. The four largest districts in Greater Minnesota are the Duluth, Mankato, Rochester, and Saint Cloud districts. The chart below contains information for these four districts plus the Elk River district, which straddles the Greater Minnesota-metro boundary. As with the large metro districts, there is considerable variation in the real per pupil aid loss from FY 2003 to 2019 among the largest Greater Minnesota districts. The amount of per pupil emergency aid that each district would receive ranges from $150 per pupil to $177 per pupil—enough to provide a considerable financial boost to each of these districts, but not enough to replace the entire real net operating aid loss relative to FY 2003. The majority of other Minnesota school districts show a general pattern similar to these large districts. The chart below focuses on a selected group of metropolitan districts. The following chart focuses on a selected group of Greater Minnesota school districts. Since the state assumed near full-funding of general education costs in FY 2003, state support for schools has failed to keep pace with inflation. As a result, the amount of total real per pupil state operating support has dropped by over ten percent. This decline undoubtedly contributed to school budget shortfalls anticipated in at least 59 districts next year and crimped budgets in many others. The post-2003 state aid decline has contributed to significant school property tax increases. Nearly every school district in the state has seen real per pupil property tax increases since FY 2003; in a majority of these districts, the school property tax increase since FY 2003 exceeds $1,000 per pupil—even after adjusting for inflation. To add insult to injury, half of all districts have less real per pupil operating revenue in FY 2019 than they did in FY 2003, as property tax increases were not sufficient to replace the decline in real per pupil state aid. It may be unrealistic in the short term to replace the entire post-2003 real per pupil school aid loss. However, the proposed emergency aid would replace at least a portion of the lost aid and provide valuable assistance to districts dealing with growing special education cross-subsidies, the rising cost of building maintenance and utilities, additional English language learner services, and declining enrollment. While the proposed emergency aid is one-time, it could provide a useful bridge for districts until the 2019 legislative session when lawmakers will debate school funding levels for the FY 2020 school year. 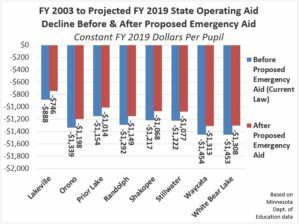 *Operating aid, levy, and property tax information in this article and the accompanying table is based on Minnesota Department of Education (MDE) “General Fund State Aid and Levy Revenues, 2003 to 2017: February 2016 Forecast” and “General Fund State Aid and Levy Revenues, 2007 to 2021: 2018 February Forecast” spreadsheets. Dollar amounts are converted to constant FY 2019 dollars using the Implicit Price Deflator for State & Local Government Purchases, based on index values reported in the MDE spreadsheets. Amounts are converted to a per pupil basis using adjusted average daily membership.